Shahaji Law College is one of the oldest Law college in the state of Maharashtra, India. It is situated in the city of Kolhapur which lies in the south-western part of the state of Maharashtra. 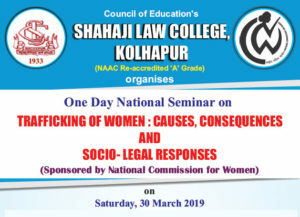 Shahaji Law College is run by Council of Education, Kolhapur. It is registered under Public Trust (No. F-8 dated 20-09-1952). The city of Kolhapur is well known for its rich cultural heritage. It also has a vibrant progressive history. Kolhapur is a land blessed by a farsighted and dedicated Monarchy in the form of His Highness Chhatrapati Shahu Maharaj, His Highness Chhatrapati Rajaram Maharaj III and His Highness Chhatrapati Shahaji Maharaj II. Rajashri Shahu Maharaj occupied the throne of Kolhapur from 1894 to 1922. He is known as ‘the King of the masses’ for his great contribution to social reforms in the country. He is also referred to as the Architect of modern Maharashtra. Rajashri Shahu established the Maratha Education Society in 1901 to cater to the needs of the underprivileged classes of the society as far as education was concerned. Under its auspices 24 Boardings were established in the city of which Victoria Maratha Boarding House was the first. He also introduced various scholarships for meritorious students from poor backgrounds. Rajashri Shahu introduced various educational programs for the masses which include primary education, secondary education, Vedic schools etc. A democrat and reformer to the bone, Chhatrapati Shahu Maharaj laid the foundation for radical reforms in the princely state of Kolhapur. The successor of Rajashri Shahu Maharaj, his son, His Highness Chhatrapati Rajaram Maharaj III followed on the footsteps of his father. He was instrumental in establishing the Kolhapur High Court and updating the educational system to include free primary education and education for women. The sole credit of the introduction of Law education in Kolhapur goes to Chhatrapati Rajaram Maharaj III. It was he who felt that there was a dire need of a law college in the princely state of Kolhapur. He was well known to take keen interest in educational matters relating to his subjects. He promptly appointed a committee to formulate a scheme and submit a report to him. The committee consisted of Late Rao Bahaddur A. B. Chougule, Chief Judge, High Court, Kolhapur as the Chairman; the other members were Dr. Balkrishna, Principal Rajaram College, Rao Bahaddur R. P. Sawant, Bar at Law Puisne Judge, High Court Kolhapur, V. G. Chavan, Judge, High Court Kolhapur to name a few. His Highness Chhatrapati Rajaram Maharaj established the Council of Legal Education in 1933. It consisted of seven ex-officio and elected members who were to look after the general management of the college. Rao Bahaddur D. M. Bhosale, the then acting Prime Minister of Kolhapur State applied for the affiliation of a Law College to the University of Mumbai on 26th January 1933. The demand was granted within five months. It was an open secret, that this was entirely due to the appreciation felt by the officials of the University for His Highness’ sincere and large hearted love for the sake of education and his subjects. The formal inauguration of the college took place at the hands of RE. Hon’ble Sir Frederic Hugh Sykes who was the Governor of Bombay at the time. The college is named after him and called ‘Sykes Law College’. His successor His Highness Chhatrapati Shahaji Maharaj is an alumnus of Shahaji Law College. After the merger of Kolhapur state with the Government, the Bombay government ran the college for two years. It then decided to close it down. But realizing the need for Law education in the region, the Council of Legal Education framed a new Constitution and came ahead to shoulder the responsibility of running the college under the able and dynamic President ship of Shri Ratnappa Kumbhar. In the beginning the college was affiliated to Bombay University and later on to Pune University. Since the establishment of the Shivaji University in Kolhapur in 1964, the college has been affiliated to it. Thus the existence of the Law College in Kolhapur was kept alive by the selfless and dedicated efforts of Hon. Shri. Ratnappanna Kumbhar who was the Member of Parliament at the time. Hon. Shri. Ratnappanna Kumbhar is an exemplary example of sheer dedication and untiring zeal. His achieved his dream to educate the masses by starting colleges in varied fields like law, management and commerce. He has done selfless service for the upliftment of the downtrodden. Hon. Shri Ratnappanna Kumbhar has been awarded the Padma Bhushan for his unmatched social service. He had to face hardships to run the Law College as it did not receive any grants from the Government till 1995. Initially the college conducted only Three Year Law Course. Later on it received permission to conduct the Five Year law course. The college also runs two Diploma course viz. Diploma in Labour Law and Diploma in Income Tax. The college also had permission to run the LL.M. course till 2001. In the year 2005 Shahaji Law College faced the National Assessment and Accreditation Council (NAAC) inspection for the first time and gained a B++. The college is currently in the process of going through its next cycle of NAAC.